Judges can make a wrong ruling, leading to innocent people receiving unfair sentences. When you believe that you received an unfair trial or sentence, contact the Criminal Law Appeals Attorneys at Fiore & Barber, LLC immediately. With 29 years of combined legal experience, we understand the nature of the appeals process and know how to best approach your case to ensure a fair result for you. Most importantly, we care about forming a close and open relationship with you so that you’re comfortable throughout the process. Dismissal of the prior verdict. We prove that your previous verdict was unfair due to improper evidence, jury bias or other factors that affected your case. Dismissal of charges. We fight to ensure a dismissal of all of your criminal charges, allowing you to move on with your life. 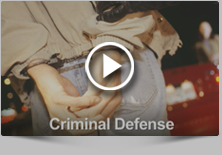 The Criminal Law Appeals Attorneys at Fiore & Barber, LLC believe in a hands-on, well-rounded defense approach that makes us successful in and out of the courtroom. You work directly with our lawyers — not any subordinates — so you can be sure that you receive the best possible defense. Let us take on your appeals case and ensure that you obtain a positive case result. Call us at 215-256-0205 or contact us online today to schedule a free consultation visit. Our hours are flexible to better serve you.